Handwriting - My Way™ is an interactive ebook created for iPhone, iPad and Mac. Available on iBooks. Beyond the scope of current handwriting applications, Handwriting - My Way is like having a personal tutor on your device. 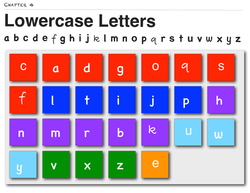 Handwriting - My Way provides multi-modal instruction for letter formation, letter identification and letter sound through the use of interactive widgets and instructional videos. In Chapter 5, Numbers, students are provided with the opportunity to learn number identification and formation. Additionally, Chapter 6, Handwriting By Grade™, provides an outline for the progression of handwriting skills from Kindergarten through Fifth Grade. Also included in this chapter are universal classroom strategies that can be used by parents and educators to further streamline instruction both between home and school, as well as inside individual classrooms, between grade level teams and between grade levels.